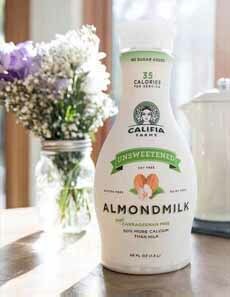  Exceptional-quality almond milk is available in original unsweetened plus 10 flavors (both photos courtesy Califia Farms). Enjoy creamy foods guilt-free (here’s the recipe for this Thai butternut squash soup). 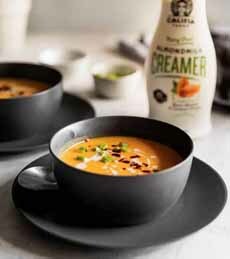 There are many quality brands of dairy-free creamers made from nuts and plants. One that we have a weakness for is Califia Farms. There are also seasonal flavors (mint cocoa, pumpkin, etc.). In fact, there are so many products that you have to head to CalifiaFarms.com and see them for yourself. The reason the products are so good are the nuts. The better the almonds, for example, the better the almond milk. And the curvy bottles always make us smile. The products are all non-GMO. Everything is made with natural ingredients, with a focus on reduced sugar in products that typically contain them, and with unsweetened products. The line is carrageeenan-free* and certified kosher by OU. Many Americans seek to add more plant-based products to their diets. More healthful. No cholesterol, saturated fat or lactose; rich in calcium, vitamins D, E and A; and far fewer calories than dairy milks. Nut milks also have 50% more protein than dairy milks. Concern for animal welfare. No cows in feedlots here. Concern for sustainability. Plant-based foods require less water and far less land pollution than animal-based products. Check out the store locator. Shop direct from shop direct from CalifiaFarms.com or your favorite online grocer. No luck? 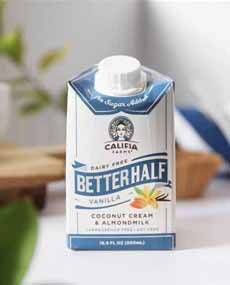 Email hello@califiafarms.com with the name and address of the retailer you’d like to carry the products. *Some people avoid the thickener and emulsifier carrageenan. While it is a natural ingredient made from red seaweed, some evidence suggests that carrageenan triggers inflammation and gastrointestinal ulcerations. Here’s more information about it. Califia replaced the carrageenan a different natural thickener, locust bean gum, which is extracted from the seeds of the carob tree.